It doesn’t matter if you’re brand new to the hobby or a seasoned racer, finding and having good tools in your pit box is a must. While a good screw driver set or needle nose pliers is important to your tool collection, when you’re into R/C you no tool box is complete without a set of allen wrenches, if it’s an R/C it’s likely got a 6 sided hex screw on it somewhere. Today we’re going to take a look at a metric allen wrench set from A-Plus RC and weather or not this set should be added to your toolbox or not. 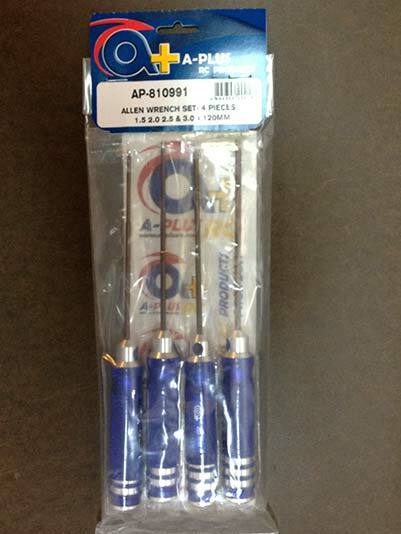 To start the A-Plus RC 4-piece allen wrench set is shipped in a simple plastic bag, along with each wrench being individually wrapped within and a sheet of A-Plus RC decals. 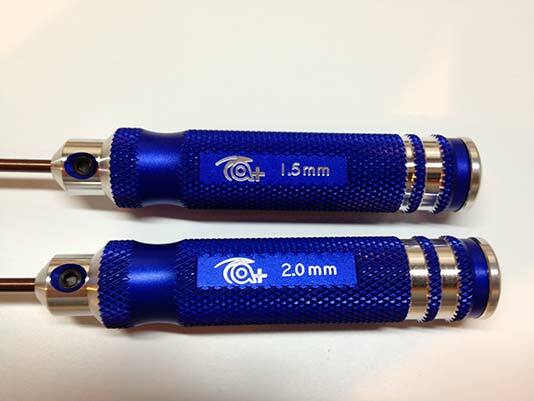 The tools themselves are very light being made of aluminum but still offers a great grip with it’s knurled surface. 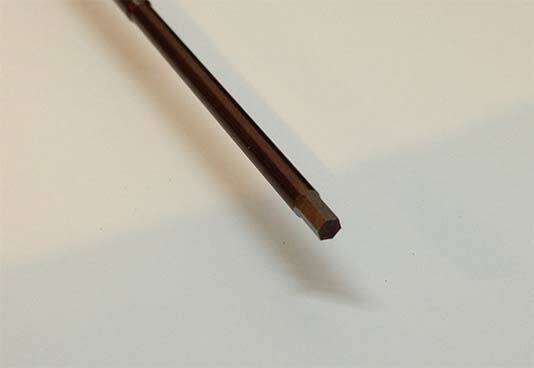 Each tool features a replaceable tip which is quickly and easily changed using a 2.5mm hex screw. Another feature of the tip and/or handle is that each handle is hollow which allows you to make each tip shorter if you don’t want the full 120mm length. Another thing you’ll notice very quickly and the very sharp allen wrench tips, very squared off and something you certainly don’t find on lower end tools sets, as they tend not to be this precise. A-Plus RC also adds their logo to the side of each handle along with it’s size. A-Plus RC also adds a silver band at the top of each wrench to show it’s size. 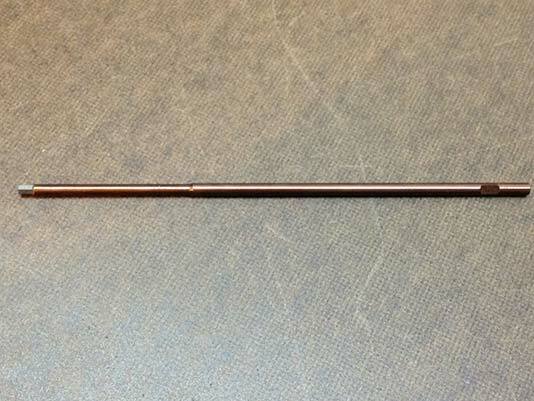 One full band equals 1mm and a half band of course equals .5mm. The silver end cap also rotates which is nice if you have the end in the palm of your hand. Speaking of the end cap on the wrench set, A Plus has made all metric sized wrenches end caps silver in color and all standard sizes have a red end cap which makes it easier to tell the two apart. I’ve been using these tools for the past several weeks and have been extremely pleased with them. They feel very sturdy and solid, yet still light weight. I had no problems at all using these wrenches working on several RC’s and I exceptionally liked the long 120mm tool tips giving me that extra reach. A feature I wish both my older Team Losi and Dynamite both wrench sets had – as they have shorter and shorter tips as the size gets smaller. If there was one thing I wished was changed/added that would be to have the sizes printed or etched on the top of the end caps. I like that they are printed on the sides and the bands are a neat feature, however while I think it works perfectly for metric sizes the standard sizes are a bit to be desired for. But really I like to hang my tools from a peg board on my work bench so being able to look at the tops and seeing the sizes right away like my old Team Losi wrenches would be a nice asset. That said, this certainly isn’t a deal breaker by no means. A Plus RC has given a number of visual cues to help assist in quickly getting the right size. Overall A-Plus has a real winner in my opinion. 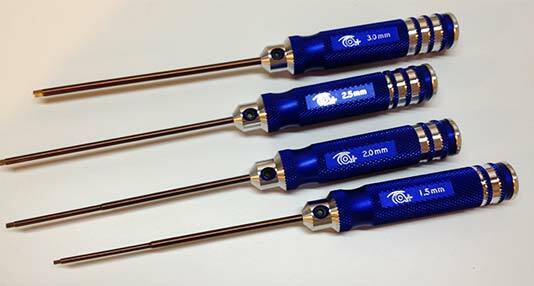 The light weight feel of each wrench and great grip. Each wrench has really held up and in the case they do wear out over time you can very easily and quickly replace each one. At less than $40 for the set we reviewed these are also a good value. In my opinion if you’re in the market for a new allen wrench individually or as a set I would urge you to really take a look at these tools from A-Plus RC Products.